Here’s how it works: Hit play, wait for GO, and then shake your phone until the screen fills up. The faster and harder you shake, the quicker the screen fills up. Once it does, you’re done! You can check out your time and your speed in shakes per second (SPS). 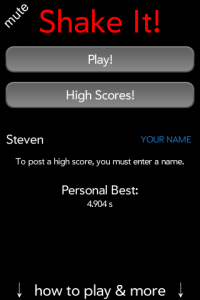 If you’re good enough, you just might make it to the top 100 high score list! If not, you can at least try to beat your personal best. It’s fast action and extremely competitive. Now you can check the leaderboard online! See who’s making the top 100 at the high scores page. Like the music? Why thank you! I made it myself using FL Studio. Like the icon? Well that was designed by Rhyne Media. Need help? Check this app’s support page.